Mmmmmumph. It is like a heavy sigh. This is the sound a greyhound makes when he is leaning as close to you as possible while you are petting him. He has to get so close that you practically fall right down with a 75 lb. dog in total shock on top of you. What could possibly have happened? Awhroo! Loud and obnoxious. This sound can mean any number of things. I don’t care if you are watching TV. Take me out now! Feed me! Where is the biscuit you promised? My water dish is empty again! The easiest answer is follow the dog around the house. He will go to what he wants. One clue, if the sound is accompanied by a tail going around like a horizontal helicopter propeller it usually means pay attention to me or let’s play right now! YYIPE! This sound must be as shrill and keening as possible. It must call attention to the poor, whipped, obviously mistreated puppy. It has a particularly good effect when used during an obedience class. “Montgomery, sit!” Montgomery is just staring at you. (P.S. Montgomery knows the command!) Give a light correction with the nylon training collar. YYYYYYYYYYYYYYYIPE! Everyone in the class turns around and looks at Montgomery’s owner like Montgomery has just been corrected with a pinch collar, a chain training collar and had his tail stepped on all at the same time. Monty’s owner sighs and gives a sheepish grin and a shrug of the shoulders. Monty thinks the whole thing is hilarious and is wagging his tail all recovered from his horrible ordeal. AAChoo! This sound occurs when you teach your silly hound to speak on command. You hold up a cookie and say, “Speak!” The dog starts wagging his tail and will actually sneeze, and mutter until he can get out a nice big WOOF! A dog seriously choking on something is frightening and proper steps should be taken to remove the object, if possible, or get your dog to a vet clinic a.s.a.p. BARK BARK, WOOF WOOF ETC. These normal doggie noises mean: A stranger in the backyard, a cat in the backyard, stranger at the front door, a squirrel is in the tree and a variety of other things. To detect all nuances would take years. Grunt, growl, mmmmmmmph. These are the sounds greyhounds make when sleeping and dreaming. Don’t share a bed or couch with a dreaming greyhound. You could end up with a big harpoon of a leg in your side. 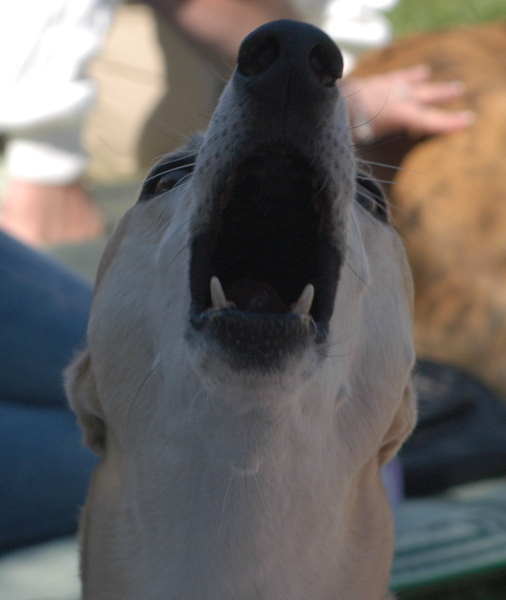 Greyhounds are dogs. They make all kinds of sounds, some cute and some downright annoying. The next time someone tells you that greys are quiet, you can say with an air of superiority—only when they are sleeping…………………soundly.